Reinhard Schaler tells the story of Pádraig and An Saol and talks about the lack of services for those with acquired brain injuries. 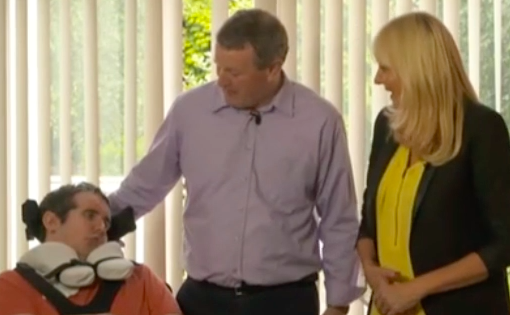 Miriam O’Callaghan reports on Neurological Rehabilitation in Ireland (or rather the lack of it); visits Shane Grogan and his family, and talks to Dr Delargy of the National Rehabilitation Hospital. Father of Irish worker struck by truck returns to Cape to raise awareness, money for brain injured. BREWSTER — While many people travel long distances to bicycle on Cape Cod for fun, Reinhard Schaler made a trip from Ireland for a more solemn purpose Monday. He returned with some friends to the scene of a crash that nearly killed his son, Padraig, three years ago to the day. BREWSTER — On Monday morning, three years to the day, to the hour, to the very minute after his family’s life changed irrevocably, Reinhard Schaler was standing at the spot on Main Street in this sleepy Cape Cod town where his son was hit by a van. On Sunday, June 26, 2016, a week after An Saol’s successful launch of its neuro rehabilitation initiative (http://www.thejournal.ie/brain-injury-ireland-padraig-schaler-2827573-Jun2016/), Reinhard Schaler (57) and two of his son’s friends, Cian Waters and Neil McEnaney, undertake a two-day bike ride from Boston to Brewster on Cape Cod. Their journey ends in Brewster on Monday, June 27 at 10h00, the exact moment Padraig Schaler, then aged 23, was hit by a truck and left with a catastrophic brain injury. 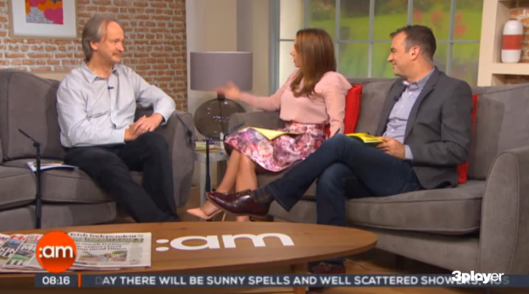 The three are raising money for An Saol’s €1.5m rehabilitation service for survivors of such injuries (see http://www.ansaol.ie). Pádraig Schaler had just finished his studies at Trinity College Dublin and had planned to spend the summer on Cape Code, working on a J1 visa like thousands of other young Irish students when he had his accident. He can see, hear and understand but, for the moment, remains non-verbal, making use of a special switch to communicate. He also has not yet regained control of his body and requires 24-hour care. We are families, friends and supporters of persons affected by a severe acquired brain injury (sABI). We have established the An Saol Foundation as a non-profit organisation, registered in Ireland. We will offer advice and support to families and friends affected by sABI. The An Saol Foundation pledges to afford every opportunity to people with severe Acquired Brain Injury (sABI) to live their life with dignity and respect, to continue to improve, to regain as much independence and self-determination as possible, and for their injuries to heal, supported by adequate therapies. For the launch, Reinhard Schaler was able to speak on behalf of An Saol and his family’s experience with their son, Pádraig. Download Reinhard’s notes by clicking here. 3. Invest in long term rehabilitation specific services in the community to provide lifelong support in appropriate settings. A second major fundraising cycle is planned for October from Hollywood to Napa, taking in San Francisco and the Silicon Valley. The cycles are sponsored by Californian bicycle manufacturer Marin and Little Sport of Fairview, Dublin. 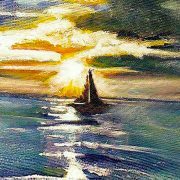 Fundraising for the An Saol Project will kick off on 26 June in the USA where a group of Pádraig Schaler’s friends will cycle from Boston to Cape Cod to arrive at the location of the accident on the third anniversary of Pádraig’s accident, 27 June, at 10am. This will be supported by a parallel “Summer Session supporting An Saol and The Great American Cycle” on 26 June 2016 in the Pavilion Bar, TCD, at 1pm-5pm, with live music from Claire Hyland and Aisling O’ Leary at 2pm and live music from acclaimed Irish folk/trad group, The Bonnymen, at 3pm. The cycles are sponsored by Californian bicycle manufacturer Marin and Little Sport of Fairview, Dublin. 18/06/16 | An Saol Day - Official Launch of the An Saol Project! We will be joined by international experts on neurological rehabilitation and representatives of national and international institutions and organisations working with survivors of severe acquired brain injury (sABI), as well a by survivors of sABI and their families. The An Saol Project will work with a small number of survivors of sABI and their families, initially over a period of 3 years, to demonstrate how intensive mental and physical activity, as demonstrated in recent research, can significantly improve social integration and quality of life, as well as an improvement in function. The project will be guided by a panel of international experts who will monitor and document progress. International collaborators will ensure that the project will be informed by current best international practice in neurological rehabilitation. We have invited politicians so that they can hear first hand about the project and express their support. At 10:30, the Lighthouse Cinema in Dublin will be the venue for the Irish premiere of the German award-winning movie “Would you rather be dead?“, organised by An Saol, following the life of six severely disabled people who have lived for many years in a care home in Hamburg. They give surprising answers to sometimes unanswerable questions. An endearing, humorous film debut that does not sugar coat, but lets the true beauty of life shine through. The screening will be followed by a discussion. Get your movie ticket today online here. Pass on the link, http://bit.ly/AnSaolFilm, to your family and friends. We want to fill this cinema!!! 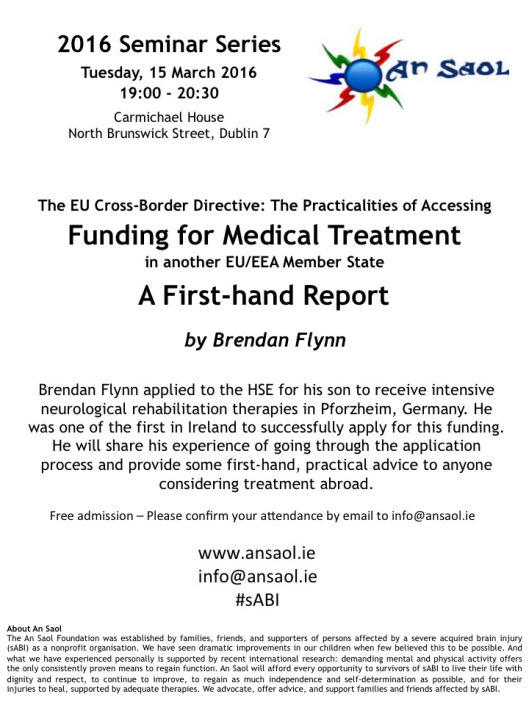 After lunch, at 14:30, we will launch the An Saol Project in the Distillery Building (Bar Council), Dublin, connecting the practice of neurological rehabilitation with recent research. We will be joined by international experts on neurological rehabilitation and representatives of national and international institutions and organisations working with survivors of severe acquired brain injury (sABI), as well as by survivors of sABI and their families. We will invite Irish politicians to express their support for the project. 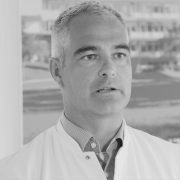 We are pleased to announce that Dr. Andreas Bender, of the University of Munich and Therapiezentrum Burgau, has agreed to speak at our launch. It will be an honor to have him join us. Small Island, a video production company from Los Angeles, California joined us in Dublin and Pforzheim to help raise awareness with us. We shot interviews with those who have something to say about how patients with severe brain injury are being looked after, and how they should be looked after. We spoke to families, those working in the voluntary sector, and those working in and researching neurological rehabilitation. This included a representative from the Neurological Alliance of Ireland, the CEO of Headway, the founders and owners of the therapy centre in Pforzheim, a consultant, a physio, and a team leader in Burgau, as well as the parents of four injured young people. We will be using the edited video clips to promote proper neuro rehabilitation for persons with a severe Acquired Brain Injury (#sABI) , to fundraise for An Saol, and to promote the launch of the An Saol Project. 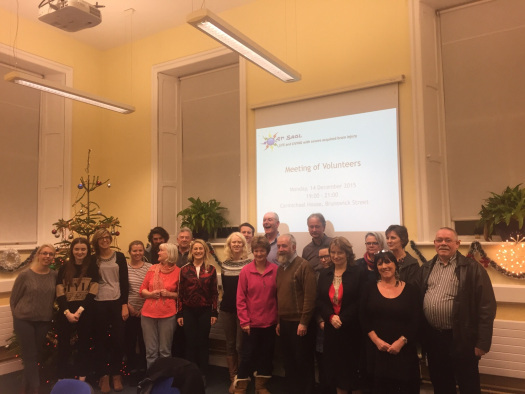 An Saol has been given permission from the HSE to use their premises at Odins Wood in North Dublin as a place for weekly Saturday meetings and networking with the survivors of sABI and their families. We are truly grateful for their support. Headway Ireland is one of the long established organisations working with and for persons with Acquired Brain Injuries. Today Headway agreed to support the An Saol Project – our proposal to run a three year pilot program to connect the practice of long-term neuro rehabilitation of survivors of sABI with current neurological research. The research shows that intensive, continuous mental and physical exercise can improve function in sABI patients,. Headway will also contribute to the discussions on An Saol Day, Saturday, 18 June (Film and Launch events). Thank you to Ken Duffy from Little Sport Bike Shop in Fairview. 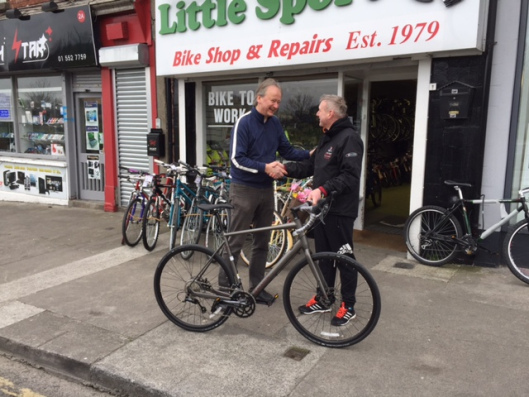 He has organized Marin Bikes of California to donate a bike and gear for our An Saol fundraising cycles in the USA – from Boston to Cape Code in late June and Los Angeles to Napa Valley in the autumn. Once we are done, we will be auctioning off the bike to help raise funds for An Saol. Many good things will come out of their generosity of sponsoring the bike and the gear! Tonight, an email was sent to all TDs, Senators, and MEPs on behalf of An Saol, asking them to support those affected by severe Acquired Brain Injury (sABI). Thank you to Therese Caherty. Without her help we would not have been able to send this out. Thank you also to the families who contributed their stories and that of their sons to this email. They cannot look after themselves. Their families are trying as hard as they can, but they find it hard to cope. For people with severe acquired brain injury, their uphill battle is one they will never be able to win alone. The survivors and their families need your support to get to a point where they can live their lives in dignity and with respect. As the 100th anniversary of the Proclamation of the Irish Republic approaches, Ireland is a long way away from “cherishing all the children of the nation equally”. Survivors of severe Acquired Brain Injuries (sABI) are not cherished – they are neglected. Instead of receiving intensive care and therapy in line with accepted international research and practice, families are told that all their children require is “hydration, sedation, and nourishment”. They are told that their children are “lost causes” on whom valuable resources cannot be wasted. Outrageously, young survivors of sABI are sent from college or their first job to nursing homes where they are put on a “maintenance” programme, deprived of a life of dignity with respect, neglected beyond belief. Each story of each of these survivors, the way they are being treated by the health system and by society, would move a rock to tears and is utterly outrageous. Taoiseach Enda Kenny, replying to an open letter just under two years ago, agreed that “the health system that we have here at the moment is unsatisfactory; it is not able to provide health care for its patients when they need it most”. HSE director Tony O’Brien has been quoted as saying that there is “no plan, no money and no vision for health in Ireland” (Editorial, Irish Times, 04 January 2016), with the editor adding that, “somewhat bizarrely, Minister for Health Leo Varadkar agreed with him”. We, the families of survivors of sABI, working together in the An Saol Foundation, are asking you as a candidate in the upcoming general elections to pledge your support for the rights of survivors of sABI. Please click here to pledge your support. We have included the stories of three survivors of sABI, as told by their families (see below). Should you have any comments, questions, or suggestions, please contact us directly either by phone or by email. Help us to change the hearts and minds of people about sABI. We look forward to hearing from you. We are families, friends, and supporters of persons affected by a severe Acquired Brain Injury (sABI). We have established the An Saol Foundation as a non-profit organisation. An Saol will afford every opportunity to survivors of sABI to live their life with dignity and respect, to continue to improve, to regain as much independence and self-determination as possible, and for their injuries to heal, supported by adequate therapies. We will offer advice and support to families and friends affected by sABI. An Saol Foundation, Carmichael House, Brunswick Street, Dublin 7. 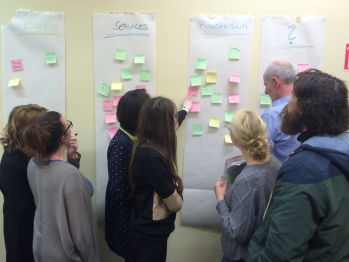 Tonight, the first meeting of An Saol Volunteers took place. There was a great turnout, there was solid commitment, and some incredible determination. In a way, it was a historic meeting which will be remembered by those who took part, as the start of activities of An Saol. Many thanks to all of these wonderful people. With these people’s help, and the support of others, change can and will happen! 01/03/14 | Open Letter to the Dept. of the Taoiseach - "Broken Health System"
we are the parents of Pádraig Schäler. He is 23 years old and had just finished his studies in TCD when he went to the US on a J1 visa. On 27 June 2013, when cycling to work at 10am in the morning on a narrow country road on Cape Cod, MA, USA, he was hit by a van and left in a coma. He was brought to Cape Cod Hospital where he underwent emergency surgery. Two and a half weeks later we brought him back to Dublin in an air ambulance. Four months later, when we discovered that the waiting time to access adequate care and treatment in one of the three beds for patients in his condition in the country’s only rehabilitation hospital, the NRH, would be close to a year, and then only for a maximum period of three months, we decided to bring him to Germany where he could access adequate care immediately. Our decision to bring Pádraig to Germany was forced upon us, we did not do this by choice. We were just too devastated by the thought that he would have to spend months on end in an acute care facility in Beaumont where we saw young patients in his condition acquire injuries, become infected with multi-resistant bacteria, and being denied adequate care. None of the above will come as a surprise to you, given that Minister O’Reilly yesterday, at your party’s ardfheis, described Ireland’s health system, for which you, he, and your Government are responsible, as “this broken health system“. As the parents of a child in a coma, or to be more precise a minimally conscious state, we can tell you that “this broken health system” has not just failed our son but has also torn apart our family. 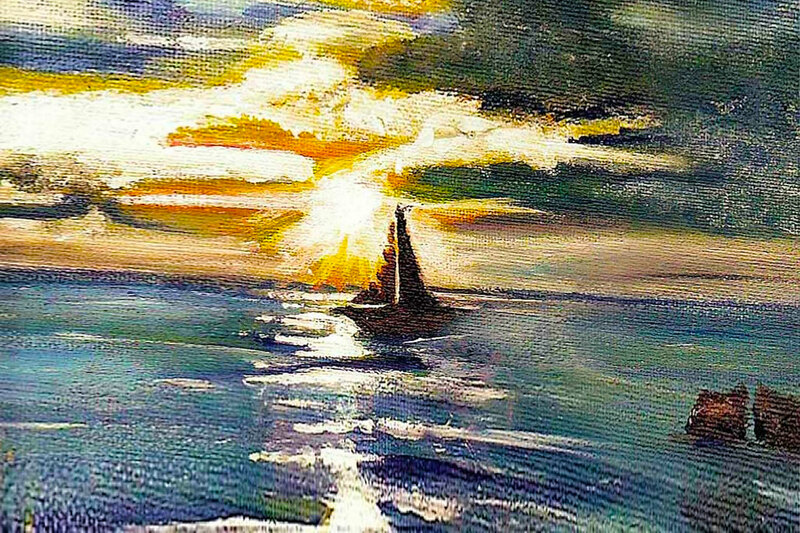 It forced Pádraig out of the country he loves more than any other, away from his friends, and the language and culture he so deeply cherishes. Under your Government, The National Policy and Strategy for the Provision of Neuro-Rehabilitation Services in Ireland 2011-2015 was published. It is devoid of vision and makes disappointing reading. Despite decades of non-investment, the plan is to engage only in ‘cost-neutral’ changes over a four-year period. The appalling lack of adequate neuro-rehabilitation care in Ireland, which has been described as “unethical” and “grotesque” by experts in the field, is well known. 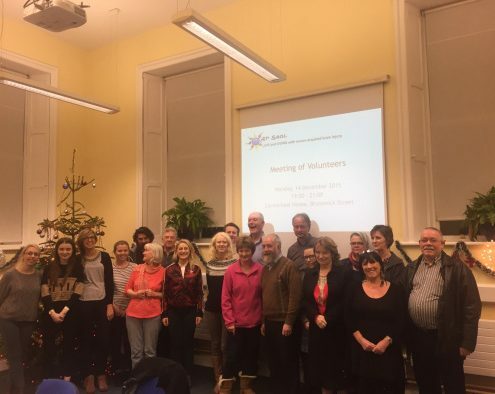 Over the last fifteen years, Professor Orla Hardiman, Dr Aine Carroll, and the Neurological Alliance of Ireland have highlighted long waiting lists and the fact that there are only seven rehabilitation consultants when we need 26. Experts agree that treatment should be timely and individualised but for hundreds or perhaps thousands – there are no statistics – of patients it is non-existent. The Convention on the Constitution reported on 23 February 2014 that it has voted during its ninth and final meeting to afford greater constitutional protection to Economic, Social and Cultural (ESC) rights, including the right to Essential Health Care. How can you, personally and as our Taoiseach – and, indeed, as a parent yourself -, how can your Health Minister, how can your Government, allow a situation to continue, where some of the most vulnerable young people of the Nation are denied their essential rights to receive appropriate health care? How can you allow a situation continue, where deeply traumatized parents, families, and friends have to go out and try to fundraise in an attempt to pay for essential treatment that is being denied to them by “this broken health system” your Government presides over? When will you be putting in place badly needed neuro-rehabilitation services for our sons and daughters? 2016 © Copyright – An Saol | An Saol is a member of the Neurological Alliance of Ireland (NAI). 2016 © Copyright - An Saol | An Saol is a member of the Neurological Alliance of Ireland (NAI).